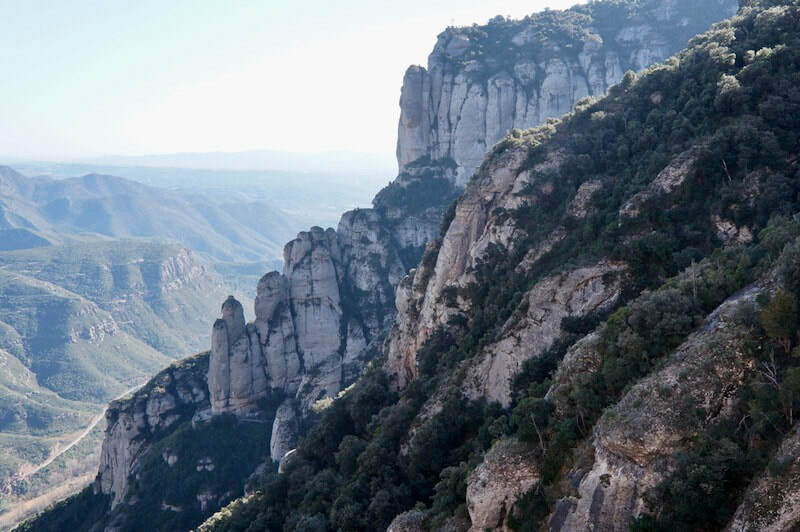 ​A towering rocky mountain ridge 45 minutes from Barcelona in Catalonia, Spain, Montserrat has three main peaks; the Sant Jeroni, Montgros, and Miranda de les Agulles. Sant Jeroni which stands at 1236 meters or 4055 feet is the highest. 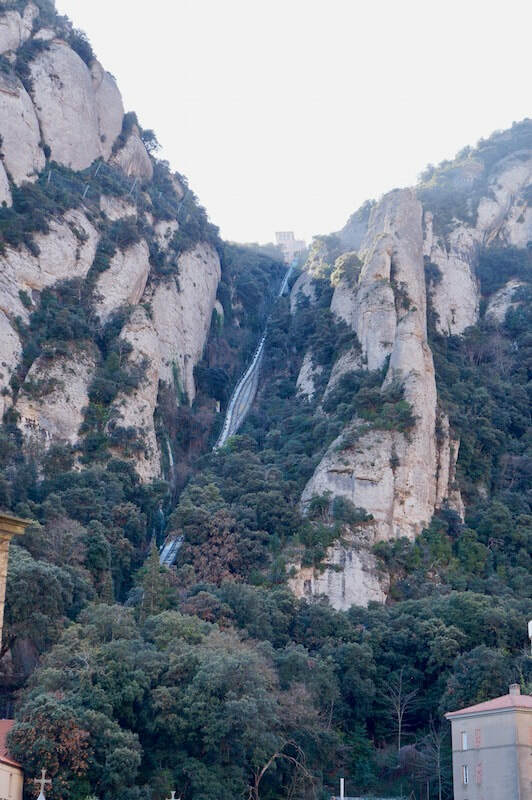 The main driver for me, to visit this massive historic site is Our Lady of Montserrat and the 10th century Benedictine Abbey filling much of the peak. 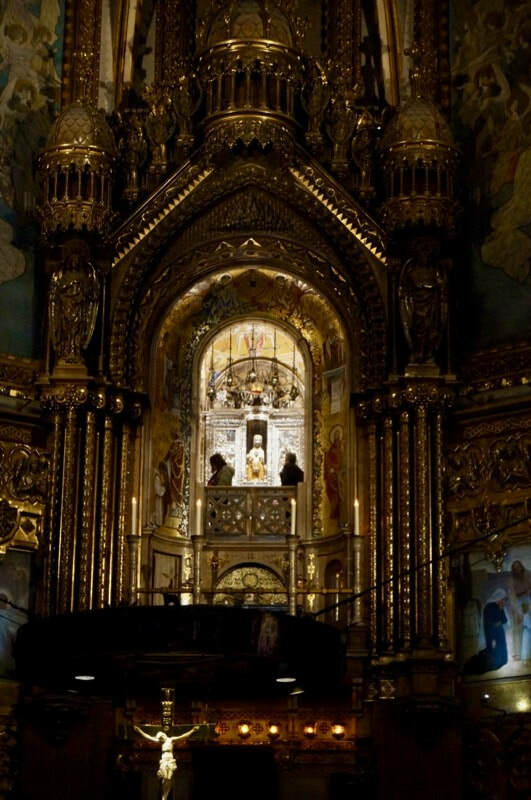 Growing up as a Catholic, I have heard of the miracles performed by Our Lady of Monserrat all my life. Many of my aunts have been named after this miraculous statue and I just can't leave Barcelona without a pilgrimage. As you can see in the map, Montserrat is part of the Catalonian pre-coastal range and easily reachable from Barcelona. So, after a chat with one of the staff in our hotel, I found out that going to Monserrat is quite easy once you're in Barcelona. In fact, this staff persuaded us not to go on the mega-buck tours but to just go on our own and be free to really concentrate on what we want to do. 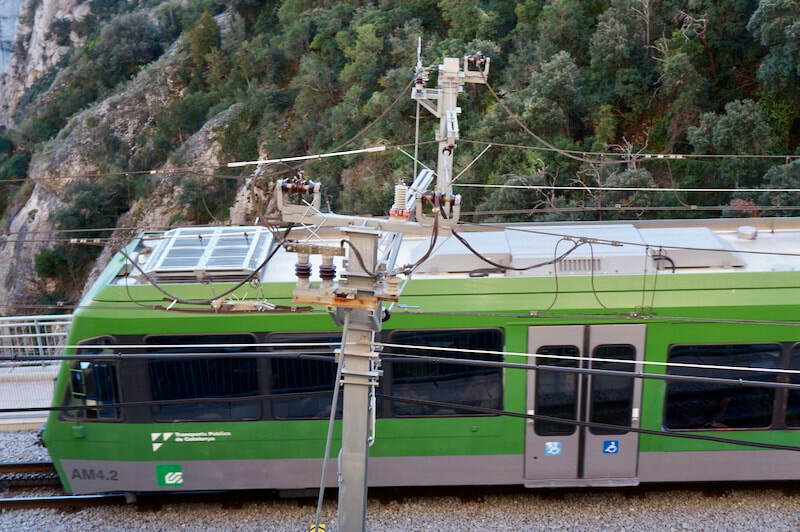 We were lucky that our hotel was only a block away from Plaza Espanya where you catch the train to Manresa the departure point for the mountain climb..
Before you take the trip, look at the train schedule online so you can plan when to leave and when to come back. If you plan to go on your own, take some food with you as sometimes, the cafeteria line-up can be long and all the food up there is pricey. 1. Go to Plaza Espanya. In the Plaza de las Torros or sometimes referred to as the arena (the round red brick coloured building). When you see the big red M sign, go down there to the subway and train terminal. 2. Follow the purple L8 and when you go down, you'll see a big sign To Monserrat. Here, there are machines for the tickets. Usually, there are staff to help you with the tickets. 3. Get a return ticket. Go to the R5 Line that goes to Manresa. Choose which one you'll use to climb up the mountain, the cable car or the rack railway. If you're afraid of heights, choose the rack railway. The view is just as stunning as it goes up the mountain. You can go in the funicular to visit the site where the statue of Our Lady of Montserrat was found. Also, if you want to have lunch, you can get a ticket that includes this. You can also decide on these other choices once you have seen the area. However, depending on the time of your visit, it could be crowded and so you need to get these choices on your ticket. The minimum is a return ticket which includes the cable car or the rack railway so you don't get stranded. Take note, Sunday is often busy because the locals like to go there for pilgrimage or Mass. Unlike many sites, this is a huge magnet for local tourism, so be ready for families and small village tribes. 4. Take the R5 train to MANRESA, about an hour from Barcelona. Look at the schedule so you can plan your return, otherwise, if you miss the last train, your only option is to hire a taxi. There are several stations where this R5 line stops. If you decide to take the cable car, you get down at the AIRE stop. Do not go down at Odesa where you will also see a cable car. Wait for AIRE. If you opt for the rail car, do not go down in this AIRE stop. Go down in the next stop, MONOSTRIL. There, the rail car awaits and just board it, show your ticket at the door. About 15 minutes, you will reach Montserrat. Upon arrival in Montserrat, you can go around the area and enjoy its incredible mountain formation. There are walks and pathways to take in this sawed mountains and you can enjoy the fresh air and the exercise and also nature's art, life and mystery. 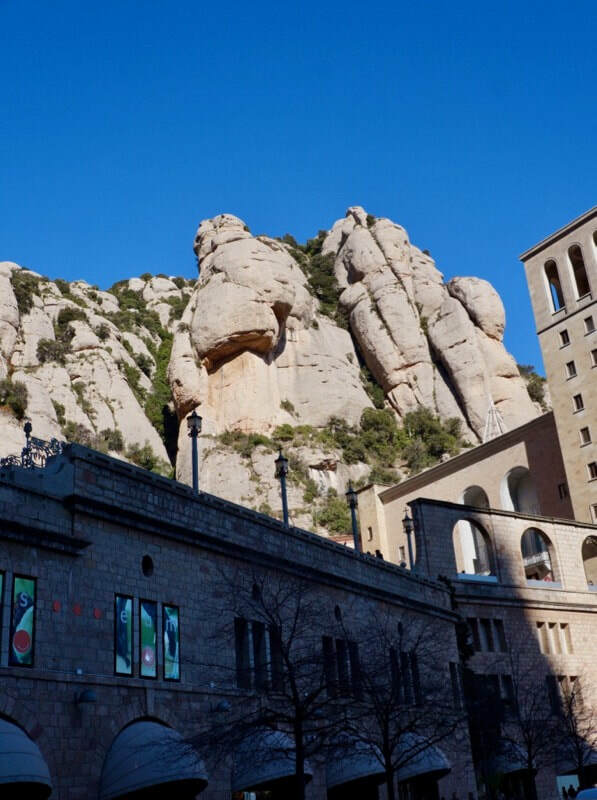 However, if your reason for going there is to do homage to Our Lady of Montserrat, you must immediately go to the Basilica and join the line to go up to her image to pray. The line can be really long but it moves steadily. At around 1 o'clock, every day, the world famous Escolania, the Montserrat Boys Choir sing the Salve Regina at the Basilica. Don't miss this. The singing is heavenly. Below is a special performance conducted by Sir Neville Marriner. 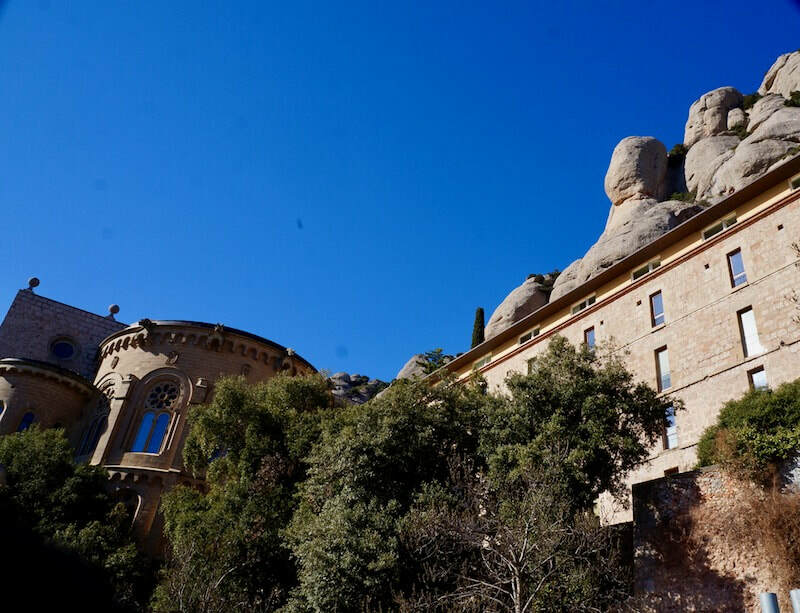 There is a museum which prides itself with works of Caravaggio, Dali, El Greco and Picasso and one of the oldest presses in the world still running today, the Publications de l'Abadia de Montserrat, having published its first book in 1499. The building was designed by one of the great art nouveau architects in Barcelona, Puig i Cadafalch. 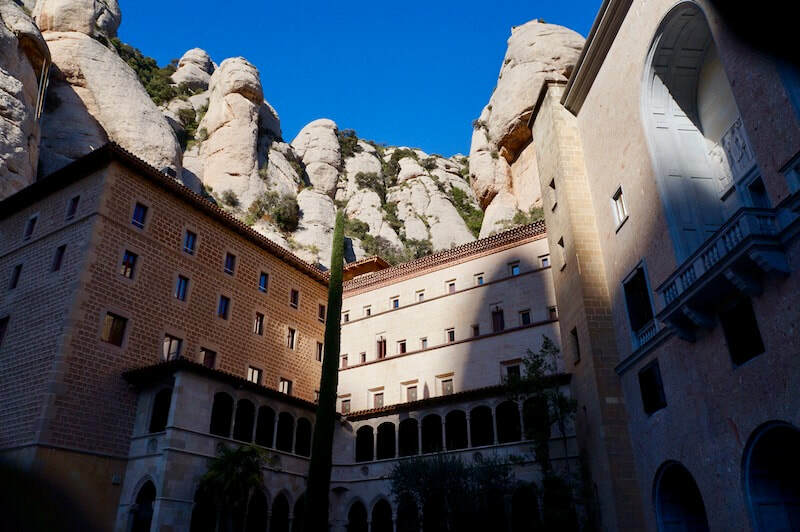 In the audio visual room, watch the documentary on the Benedictine Abbey's history, the miracle of Our Lady of Montserrat and the legends that surround the mountain of Montserrat. For those who are hungry, there is a cafeteria and the food is decent. A visit to the Abbey could be worthwhile. It is not, however, open to the public, so check first. About 5 minutes by car from the Abbey is the Monastery of St. Cecilia, an old Romanesque Church built in the 11th century. The famous Irish born but American-based abstract artist, Sean Scully, had redesigned its interiors and the large scale vibrating hues of his geometric paintings with the Church's ancient stone walls create something profoundly unusual. Take a tour of St. Cecilia to have a sense of this. For those who are driving up to Montserrat, there is a parking area and from there, the rail car brings you up. There are also many tours you can book in Plaza de la Catalunya and Plaza Espanya or online for those who prefer to have things arranged for them. ​The miraculous image of the Virgin of Montserrat was popular among the peasants in the early days as La Jerosolimitana, Jerusalem's native, because it is believed that it had been carved there and given to St. Etereo, the bishops of Barcelona, who brought it here. However another legend tells of St. Luke as the carver of the statue. When the Saracens invaded the area, a group concerned with the safety of the image, with the knowledge of the Bishop, placed it in a cave in Montserrat on the 22nd of April 718 as recorded in the archives of Barcelona. For almost 200 years, the image stayed there until shepherds in 890 , reported to the priest they had found the cave. They informed the Bishop, that they saw lights and heard singing in the mountains. Following this, they discovered the image of the Virgin. ​A 3 foot tall statue, the Virgin sits on a chair with a cushion as a footrest. Her right hand holds a sphere and on her lap sits the Child Jesus, wearing a crown with his right hand raised in blessing and the left holding an object that is akin to a pine cone. Both the Virgin and the Child Jesus are completely gilded and it is claimed that this statue presiding in today's Basilica can be traced to the 12th century when the original one may have been destroyed. ​However, the statue continues to draw pilgrims from all over the world. Some of the best known are Pope Benedict XIII, Columbus, Cervantes, King Fernando and Isabella, Carlos I, Felipe II and Louis XIV. Columbus named on of the Antilles islands Montserrat on his second voyage there in 1493. San Pedro Nolasco was here in Montserrat around 1203 and worked hard to protect the slaves and victims of the constant warfare between the Christians and the Moors. St. Ignatius of Loyola also came here as a Pilgrim and left his sword here having decided to offer his life to Jesus. From here, he retreated to a nearby village, Manresa, where he wrote the Spiritual Exercises. and later founded the Society of Jesus. The Abbey has played a significant role in the history of Catalonia and has become central to the faith of the people and a symbol of Catalan nationalism. It is not surprising to see so many Catalonians come here to do pilgrimage especially on a Sunday and many young people walk up the steep mountains to watch the sun rise or to have retreats here. Founded in the 10th century, the Abbey still functions today with around 70-80 monks. Before the Abbey, in 888 there was already a Chapel dedicated to Our Lady and that was expanded with the building of the Abbey. Since its foundation, the Abbey has seen so much history and has suffered from its impact. In 1811-12, the Abbey has been burnt down and sacked by Napoleon's troops losing many of its treasures. In 1835, the Abbey was closed down for restoration and was again reopened in 1844. It was during the Civil War that the Abbey saw its worst beating as 22 of its monks were among the 278 priests and 580 religious men and women killed by the Republican forces. Under the rule of Francisco Franco, the Abbey became a sanctuary for scholars, artists, politicians and students who were being hunted by Franco's men. From then on, the Abbey is often seen as the centre of Catalan nationalism. At a Mass held in 1947 to celebrate the enthronement of Our Lady of Montserrat, prayers were said in the Catalan language defying the Spanish government's language policies. In 1970, a sit-in by 300 Spanish artists and academics protesting the death sentences of 16 Basque ETA activists in Burgos caused the Monastery to be sealed off until all the protesters were removed but the sentences were commuted. Today, the monks continue to live a life of silence, prayer and work and while the Basilica is open to the public, the Monastery is not. Montserrat is the perfect tourist magnet. It combines items of significant religious importance to the Catalonians, with the attractiveness of a mountain Aire requiring Swiss determination and tourist optimism to reach. 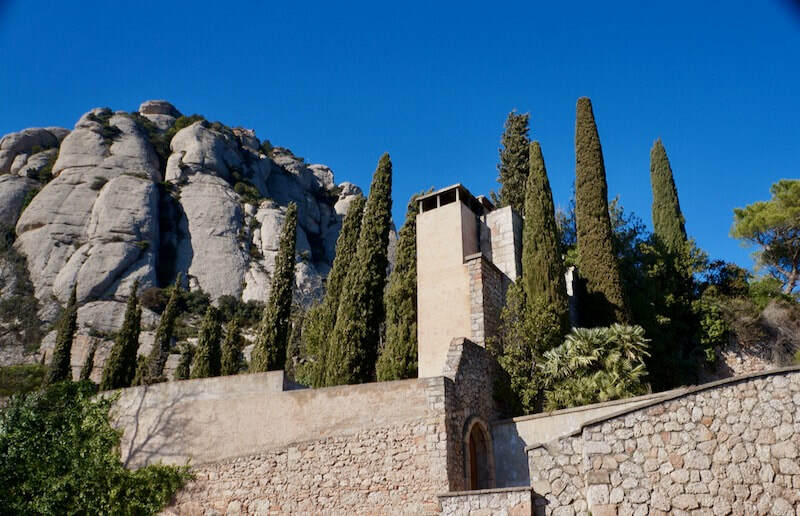 Below is a video of Montserrat to give you a glimpse of this holy mountain. As you move up to the Benedictine monastery, you'll see the significant expansion afforded by tourist success. The majesty and uniqueness of the mountains is truly breathtaking and the vistas of the plains spreading out below give a hint of what 12th century peasants may have thought as God's view of the world. 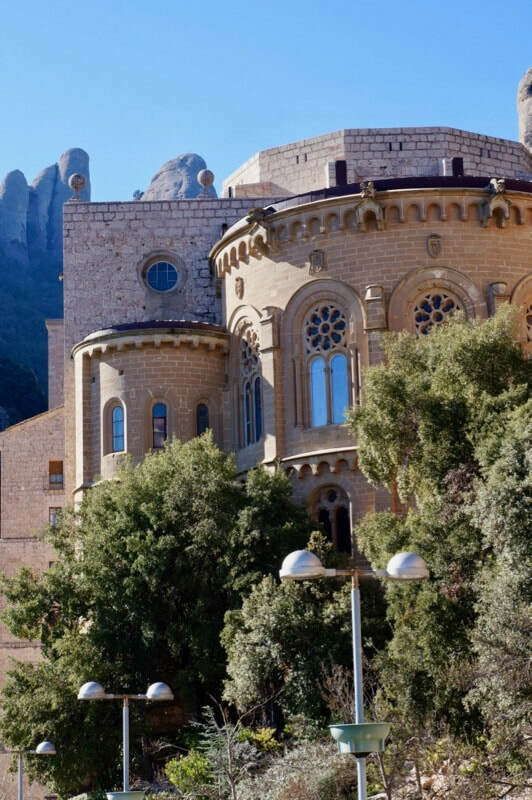 ​In today's world, the massive influx of tourists from Asia almost makes Montserrat appear to be a Buddhist retreat rather than a Christian one but in order to survive, mammoth continuous investment is needed in the infrastructure and the Asian tourists have those resources. One can only hope that locations such as Meteora and Cappadocia will equally benefit and survive for further generations.